On last night's How I Met Your Mother, Barney gave Marshall some advice on how to keep from getting laid off: "You just need a way to make yourself absolutely essential... You need a thing. Something that makes you fun and well-liked." They go through the different characters that they have at their office, including Toy Guy, YouTube Clip Guy, Creepy Backrub Guy, and Food Guy — the guy at the office who always has food. 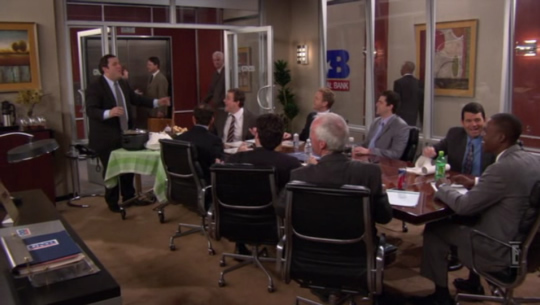 Throughout the episode, even sometimes in the background, you see the food that the Food Guy brings to the office: doughnuts, pulled pork, cotton candy, churros, at one point even an entire hot dog stand.